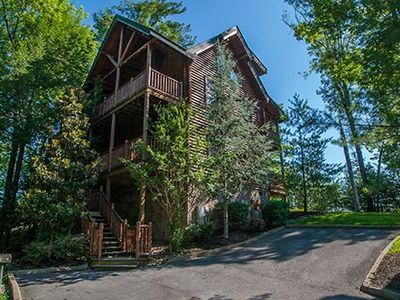 10 minutes from Dollywood 1/2 mile from Pigeon Forge's famous strip. Nauture's Best is just that. 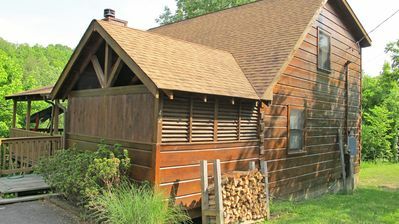 Tastefully decorated by the matriarch of the family, every stick of fiurniture, every piece of linen down to the towels is a 5 Star quality experience rivaling the finest of hotels amid the coziest of cabin living. 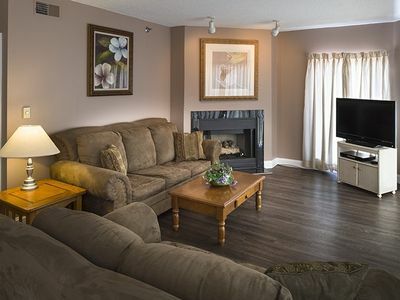 Each level features its own master suite with 32' inch cable flat screen TV's. The top level offers a master suite that we like to call the "cathedral bedroom." 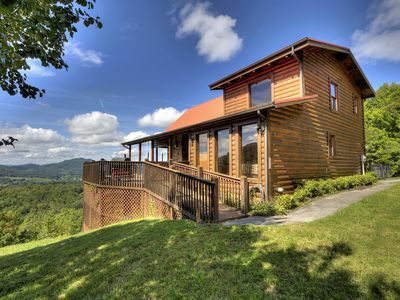 It comes with a private full bath and is ajacent to a loft living area. 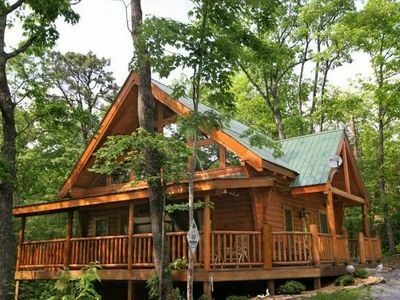 The main level offers a master bedroom with a king size bed and full bath adjacent to a full size kitchen and an 8 person dining area. 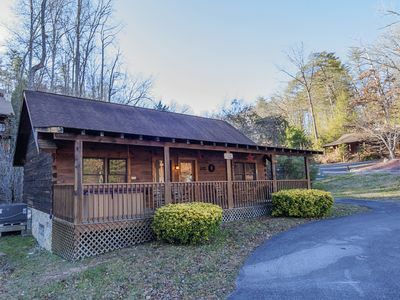 The full length porch is screened in and has comfortable seating and a gas grill. 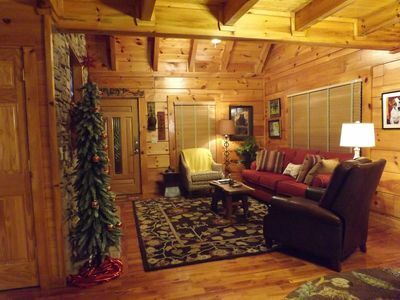 The living room features 25 foot ceilings with a gas fireplace for the coldest of Smokey Mountain nights. The bottom level offers a third private bedroom and full bath adjacent to the entrertainment headquarters featuring a 60' inch Smart HD TV with DVD player, full range WiFi, wet bar and mini fridge, pool table that can also be coverted into a ping pong table, and a retro video game machine featuring all the top 60 classics from the 80's including 8 different Pac-Man versions, Donkey Kong, Dig Dug, Galaga, etc. 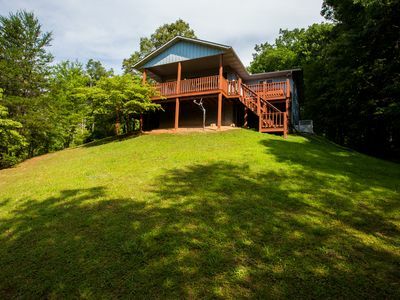 The bottom level also features an unscreened porch. 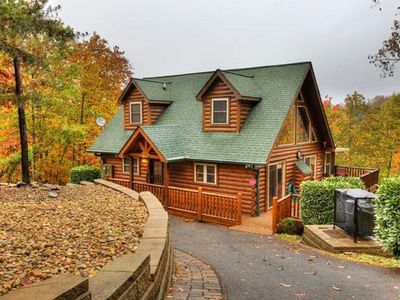 The cabin is located in the private neighborhood of Alpine Mountain Village. 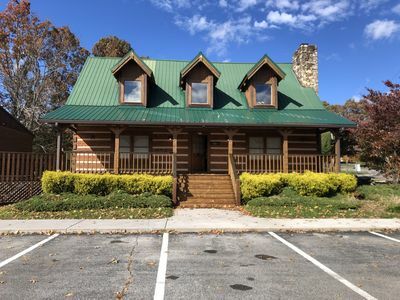 The neighborhood is safe, pristine and has a tangible community feel with tranquil nature walking trails, a quaint on site chapel, covered picnic pavilions and two outdoor swimming pools. 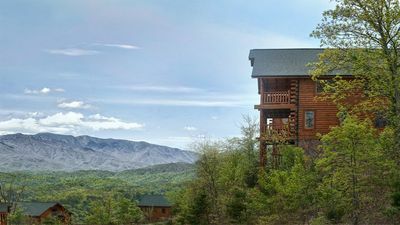 This gorgeous retreat is a short hike from all the best entertainment (3.8 miles from Dollywood and 2 miles from The Tanger outlets), restaurant spots Pigeon Forge has to offer and is a hop, skip and a jump from Gatlinburg. Dollywood,Dollywood,Dollywood. 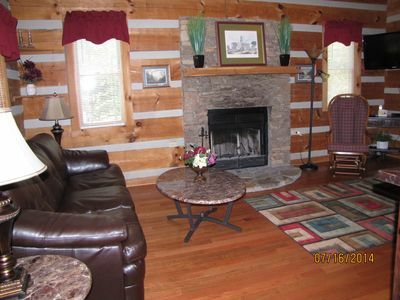 Real Log Cabin 2 Bedroom, 2 Full Bath, Full Kitchen Close To All Attractions. 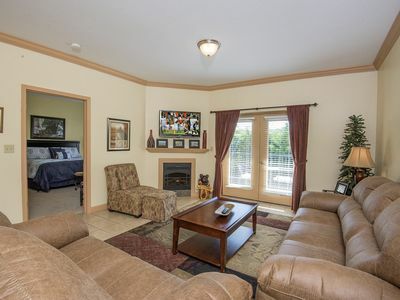 Spacious luxury condo with Great Beds in a Great Location!!! 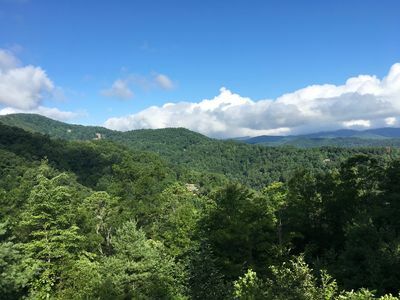 Country Livin' in the Great Smoky Mountains .AC. Wifi. Grill. Cable TV. Hot Tub. CUTE 1BR-1.5 BATH! -- $99/NITE! /WIFI! /HOT TUB! /PKWY CLOSE BUT IN THE MTNS! 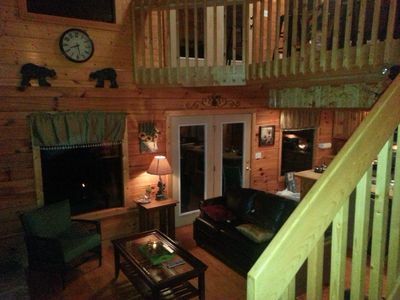 Bears Den - Great Cabin! - Great Location! 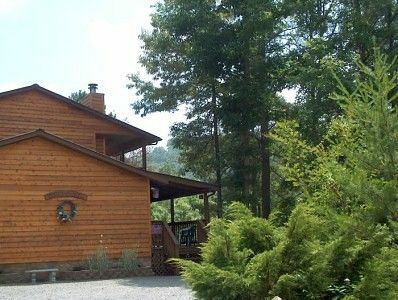 10% off for Whole Month of February - MV5205 - GREAT LOCATION! CLOSE TO ALL THE ACTION! 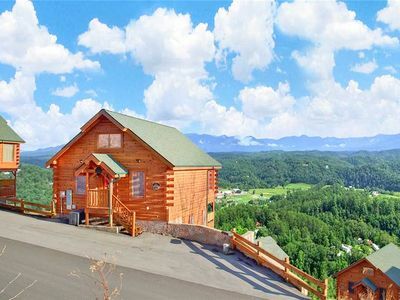 Private Smoky Mountain 5 Bedroom cabin with KNOCKOUT MOUNTAIN VIEWS! 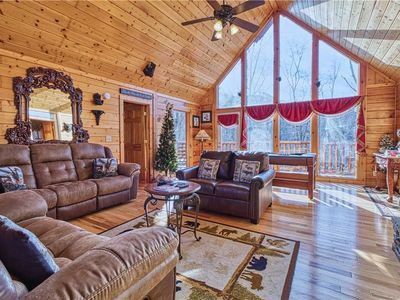 5 Bedroom 4 bath log cabin in Pigeon Forge, close to all the attractions! 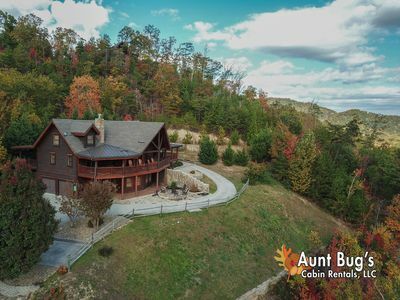 Game Room, Fireplaces, Hot Tub and Master Suite with a Jacuzzi! 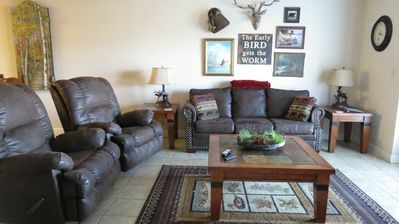 ER301, EAGLE'S HIDEAWAY - GREAT LOCATION! CLOSE TO ALL THE ACTION!